Very informative course.Would like to do a hair transplantation course in future from ILAMED.Dr.Rohini Radhakrishnan. MBBS, MS, Otorhinolaryngology. Chennai. It was really a good experience.Agenda & timing to be possibly more precise.Dr.Shabeena Sayidmasnthn, MBBS, MRCGP, DPD, DRCOG, General Practitioner, UK. It was very wonderful, sad that I missed 3 days. Missed main topics as LASERS, fillers, botox, peels due to my absence I was not strong in these areas.Sowmya Dogiparthi, MD Dermatology,Dermatologist, Chennai. Very confident after doing these course. Would like to enroll for FAM in future.Dr.Sathish Kumar A., MD(DVL), Chennai. Excellent course.Dr. S. Hemalatha Rajmohan, MBBS, Chennai. I did PGDCC Course from ILAMED held at Hyderabad. I really felt the teachings of Dr. Rana excellent and very helpful. I experienced a high grade professional touch up in Dr. Rana teachings & Dr. Siddharth, including Theory & practicals too.I want to pursue PGDMT course also. Thank you very much sir, Dr. Tawoose Tasmiah.S, Santosh Nagar, Hyderabad. It was wonderful experience to learn in an Institute like this. This Institute builds up confidence which is really important for every cosmetologist. Special thanks to Dr. Ajay Rana and Dr. Siddharth.Dr. K.Sameera, East Godavari Distt., AP. I Dr. Srisha joined PGDCC programme in ILAMED. Its a great opportunity to learn in presence of expertised persons & skillful hands. Special thanks to Dr. Rana sir & Pooja who was in touch with me reg programmes. Dr. B. Sirisha, MAMC clinic, Vijayawada (AP). Well organised course with good information. Suitable for beginners, with “hands-on” experience. Mr. Anirban Mandal, MS, MSc FRCSEQ, FRCS Plastic Surgery, MCHT. London. Good experience. Hands-on training is good.Dr.Jasjit Singh Virk, MS(General Surgery), MCHT.Phagwara (PUNJAB). Hands-on training is very effective and information was new. Video demonstration was also good. Thanks ILAMED for organising such a training.Dr. Md. Shah Zaman, DDV, MCPS, MCHT.Dhaka (BANGLADESH). It was above expectations. Hospitality was really good. I hope this course will give an extra edge to my practice.Dr. Amit K. Gaba, MDS, MCHT.Ludhiana (PUNJAB). I, dr. Sanyukta Shrivastava, had joined PGDCC course at ILAMED, Delhi. The well planned, comprehensive yet exhaustive courses are perfectly suited to practitioners who find it difficult to pursue further education due to lack of time. The courses involve thorough explanation of the relevant topics with demonstration of all high end as well as economic technologies and hands on patients. The ability of our guide, Dr. Rana, to reach upto the level of all medical as well as non medical students accompanied by his expertise and experience in the field of cosmetics makes the classroom sessions highly interactive. The simple and practice ideas he offers to adopt can help all students to establish correct diagnosis, choose apt treatment options and parameters, avoid complications and manage if any occurs. I personally have thoroughly enjoyed the sessions and found answers to all my questions which is definitely going to benefit me in my practice. Thanks to Dr. Rana for a genuine investment. To start had a great experience at ILAMED. The entire team has helped fantastically. My regard to Dr. Monica and also thanks were for being the reason to join FAD ILAMED and also to introduce us to Dr. Manish Agarwal.Had a wonderful time doing hands-on and attending theory.Special thanks to Dr. Manish suburb towards aesthetic. Thanks to Dr. Ajay Rana to help understand toxin and fillers better. It was a very good course, I found many things which were interesting , I hope to attend more courses with you, I would like to say thank you Dr. Rana sir and Dr Sumit for your efforts. I had a great experience in this workshop. Nice teaching by Dr Rana. Good content & live demostration was there in the course. Big thanks for his time & concern for me, to recap the subject when I was absent for a day. Altogether it was a good experience & help especially for beginners to set up their cosmetology clinic. Dr. Rana’s lectures were really informative and covered cosmetology in a easy way. I gained a lot of clarity on the subject after attending the contact program dr rana is an excellent teacher , and the whole class participates in the discussions is great. Thank you Dr. Rana and ILAMED. Absolutely loved the experience! Haven’t came across a more inspiring “Doc” before! Looking forwrad to attending more workshops & getting a chance to learn more from Dr. Rana. A great course conducted well, concerned nicely. A good eye opener, indeed great beginning for cosmetology. It was very good experience in learning with Dr. Rana. It was very fluent as well as in easier language. 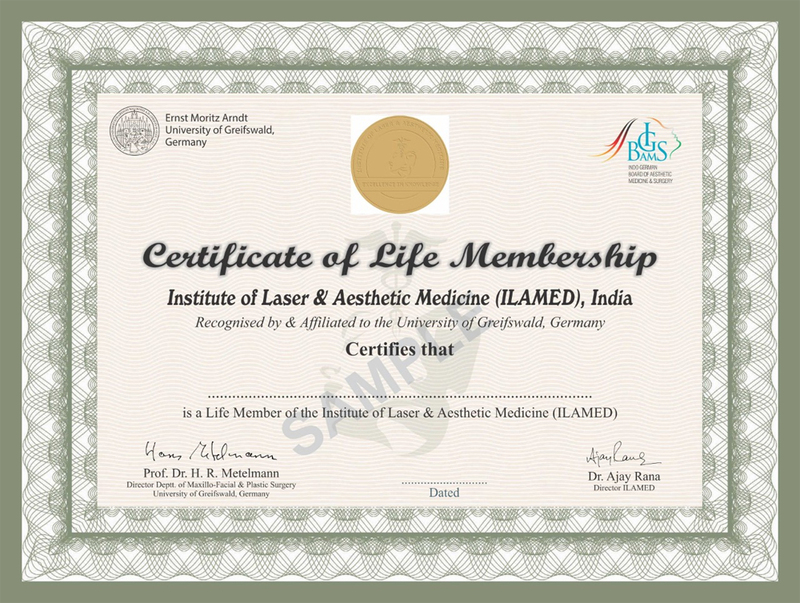 I had always been looking for best institute for aesthetic and did lot of research over it finally. Completed Fellowship in Aesthetic Medicine (FAM), had good experience and exposure towards laser, came across many latest machinery. Last but not least need improvement regarding exposure towards patients and hands on.Dr. Amit Karnani, M.B.B.S. It was a good experience to be here for PG Diploma in Clinical Cosmetology (PGDCC). Nice lectures on lasers and other aesthetic procedures. But hands should have been better. Thanks to Dr. Ajay Rana for very nice explanations of the topic.Dr. Ankur Mishra,B.H.M.S. I had a good time there in ILAMED. Doing this course I have learnt many things which will further help in my practise. Dr. Rana’s lectures were very good. He guided us a lot. I will be very thankful to Dr. Rana and Puja.Dr. Ajay Trivedi, B.H.M.S. The FAM was a great experience, the knowledge and teaching levels are extremely high and so is the hands-on training. I strongly recommend this program! Learned quiet many new things. Thought cellulite is something to do with cellulites…! Lately…did I realize what it was….! Mesotherapy of course- very very interesting. Interesting hands-on demo by DR. COULON. Mesogun- saw for the first time. Nappage- hands-on on the sponge simulating skin surface really cool. Best one- hands-on taught by Dr. A.RANA Meso-Fat. Good demo with facial rejuvenation using mesotherapy was great. It was a quite knowledgeable seminar and many new aspects were discussed. The discussion was quite good. The demo by Dr. HEMA was very interesting and added to my knowledge a lot. Good platform for learning and sharing experience. Nice and actually an informative session. I feel good & confident after attending Mesotherapy workshop organized by ILAMED & look forward to attend much more workshop on aesthetics.Dr. Gagandeepsingh Ahuja, Noida, U.P. It was very interesting mainly PRF & PRP. Dr. Soni Nanda & Dr. Lokesh taught very well about mesotherapy. We got more which we expect. We got more about cosmetic marketing from there every presentation was international standard.Dr. Nisar K.T.